Main Station: What you get if you stick the Pizza Hut logo on top of a space station design from a Star Wars rip-off. It's one of the largest buildings in the city and most people here longer than a week have used it. Multiple malls, passages, and MRT stations extend underground and you will probably have gotten lost in these tentacles. Due to the Railway Administrations' arcane booking system and websites I usually just turn up and book a ticket on the spot. This sometimes means I have an hour or so to kill if I want a seat ticket. This post will be both about the history of the station and stuff to do around it if you've got a wait. There are a few surprisingly tranquil and interesting spots in the immediate area. This is the 3rd major station building on this site. The earliest station here was built in 1901 and bore a resemblance to the old Taichung Station. There was an even earlier Taipei Station towards the Dadaocheng area, built in 1891, but this was a very small scale shed. The 1901 station was quite elegant but by the late 1930's the city had outgrown it. In 1941 a newer station was completed in the modern and slightly authoritarian style of the time. This was one of the last large Japanese era public buildings in the city. By the time of its construction this station was at the de facto center of Taipei. It stood at one end of the current Chongqing South Road, then one of the city’s grandest streets, with the current National Taiwan Museum facing it at the other end. The present day Main Station building is about a block further east. The 1940’s station building at the start and end of its existence. By the 1980's this station was quite crowded and a little run down looking. The large railway yards and tracks through the city were also taking up a lot of expensive land. Tracks used to run through the middle of Zhonghua Road and along what is now Civic Boulevard. The railway administration embarked on an ambitious rebuilding that moved all the tracks underground. They erected the current building and incorporated it with stations for a new rapid transit network; the MRT. There was an interim station building between 85 and 89 while demolition and construction was taking place, but as it was just temporary I haven’t included it. Since then it's continued to grow. Annual passengers were at 114.987 million in 2017 and must have grown since then with the airport line. I can’t find a reliable list past this one from 2013 but here it is the 25th busiest station in the world by passenger numbers. It connects with 3 regular MRT lines, the high speed rail, main bus stations, and most recently the airport metro line. My own drawing of the Taipei Main area in the early 1940’s from Historic Taipei. You can see the Osaka Merchant Shipping Company Building directly south of the station. The east area contains old wooden dormitories, some of which are still there. 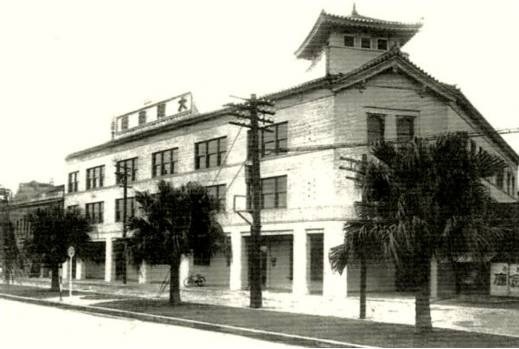 Taipei also used to have a roundhouse similar to the one that still exists in Changhua. The grand building with the walled garden in the center bottom is the Taipei Railway Hotel. This was destroyed by bombing in World War 2. What to do Around Taipei Main? This is an old wooden hotel built in 1900. In 1913 a visiting Sun Yat Sen stayed here just after resigning as President of the Republic of China. 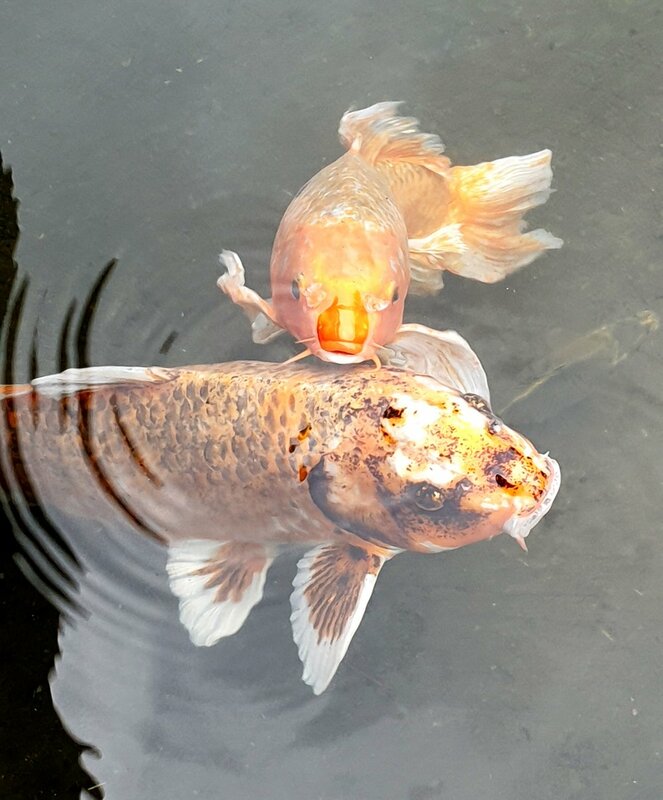 The hotel was moved to its current site in the 1980's and is surrounded by a pretty park with a koi carp pond. It’s also open on Mondays unlike a lot of other places in the area. Inside the building you must remove your shoes. There are documents and other memorabilia from Dr Sun's stay on display though it won't be of much interest to the casual visitor. I mainly visit this park as an escape from the busyness around the station, though the noise from Civic Boulevard lessens the peace somewhat. Thailand, Vietnam and the Philippines represented here. Just to the south of the Sun Yat Sen Hotel is a small area of alleys with businesses that mostly serve migrant workers from Southeast Asia. There are a few restaurants and convenience stores with imported products. Among these alleys are the last few wooden railway dormitory buildings from before 1945. They are the only part of the old main station complex to survive apart from the workshop and HQ area around Beimen. Next to the east station exits there’s an old steam train from 1923 and railcar from 1957 on display. 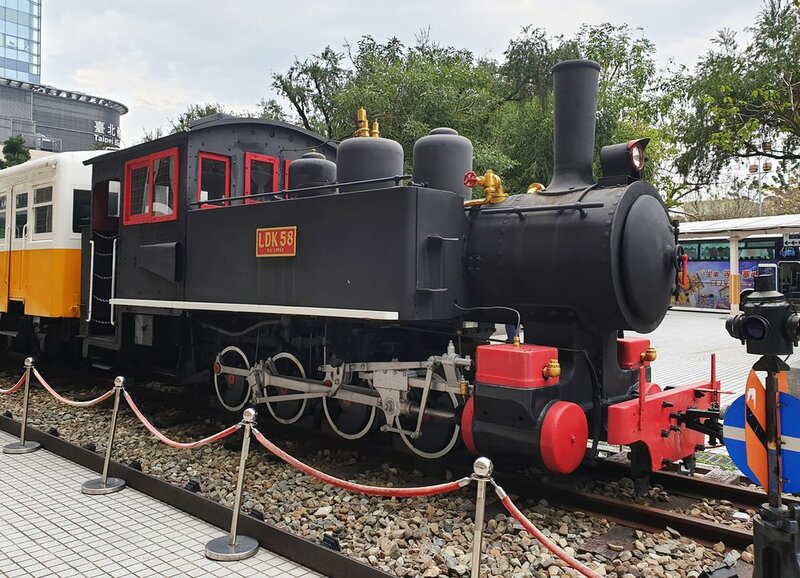 I was surprised that the steam train was used all the way up until the early 80’s in east Taiwan. Next to Taiyuan Street is another blue railcar but I haven’t found much information on that one (there is apparently a plaque that I missed. It served the electrified Keelung railway, thanks Jay). I put it in one of the towers which included a lot of buildings in the Taiyuan area, and obviously forgot to draw the front coupling. The Osaka Merchant Shipping Company Headquarters was built in 1937 for a prominent Japanese logistics company. From the 1960's onward it was covered in tiles. All ornamentation and the tower were removed and an extra floor was added. If I hadn’t been drawing old Taipei I would have thought it was just a plain 1960’s office building. This year it's being restored to its former appearance and it will house a photography museum when finished. The tallest building in the city before Taipei 101 opened and the money in the city shifted eastwards. There used to be an observatory on one of the upper floors but apparently that's now owned privately. There's no real reason to visit now unless you want to shop in the large department store on the first few levels. After a short walk past the white airport MRT buildings on the west side you'll arrive at the North Gate Area. There's quite a lot in this area and it is covered in a separate blog post here. The north side of Taipei Main was known for a long time as the rear station. For many years an ice factory stood here before it was replaced by the Q Square bus station and towers. One warehouse hung on until about 2012 when it too was demolished. I had an old photo from then but can’t find it. Luckily Streetview has a clear view. I have seen images of it incorporated into the new construction but I’m doubtful that it will be done especially well. 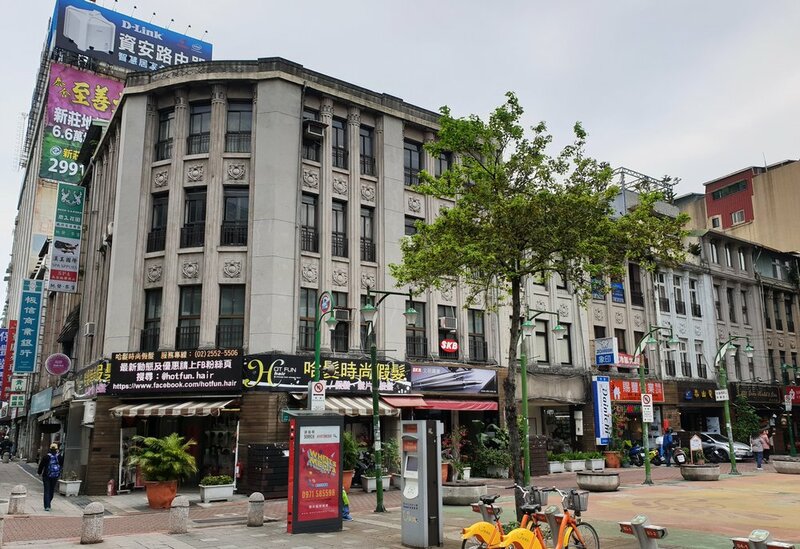 Taiyuan Street was rebuilt in the 1940's in an elegant colonnaded style. It begins in a plaza next to Civic Boulevard which has kept a somewhat European feel. This style is visible around the city, but especially in this area. I quite like it. From here there are a few streets and blocks of old shophouses if historic neighborhoods are your thing. A lot of it is really quickly disappearing. Almost all the brick houses on Yanping North Road that I remember from 7-8 years ago have been replaced with highrises. One of the few blocks left on Yanping. The area between Taiyuan and Chongqing Roads is one I unofficially call Clutter District. These shops are full of knick knacks and DIY/craft supplies. There are entire shops that just sell different types of beads. Most of it is the sort of stuff you buy for a rainy day project that you never get around too. Eventually it becomes clutter in a cupboard. If you have a lot of time to kill the Museum of Contemporary Art is a good bet. Exhibitions are always rotating. I have found them a little hit and miss but there's a chance there may be something thought provoking on at the time of your visit. One downside is many exhibitions don't have English translations for their descriptions, leaving you guessing at whatever abstract idea is being communicated. The museum itself is housed in a pretty old red brick school. On the right side of MOCA is another Japanese era building that has been renovated recently. It was built in 1930 and has had many health and welfare uses throughout its history. Currently it is used as the Department for the Welfare of the Disabled. This runs beneath Zhongxiao West Road at the front of the station. It's mostly full of cheap and fairly unfashionable clothing. There are some souvenir stores and cellphone accessory shops too. I don't really spend very much time in this one as it's stuff you can find in any night market. Parallel to the station front mall this is supposed to be the classier alternative and is associated with the Eslite Department Store. There are a few shops selling nicer accessories and clothing but this one always feels a little dead. I get the impression few people know it's here. This is the more interesting one. This mall runs under Civic Boulevard (the road with the elevated freeway on top) and is very long. The first part is a center for videogames, anime, and manga. 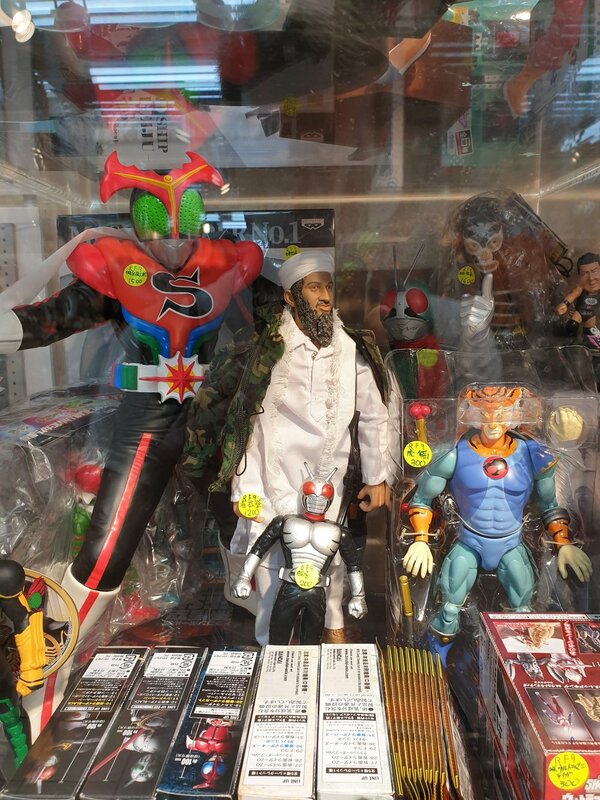 Some shops are stuffed with models and action figures from even obscure series. Further along there are maid cafes (I don’t honestly know what goes on in these) and then at the very end there are a collection of Indonesian restaurants. There’s a very good blog post about this particular mall here. The first section of this mall up to Zhongshan Station is fairly uninteresting. It's mostly luggage and accessory shops. 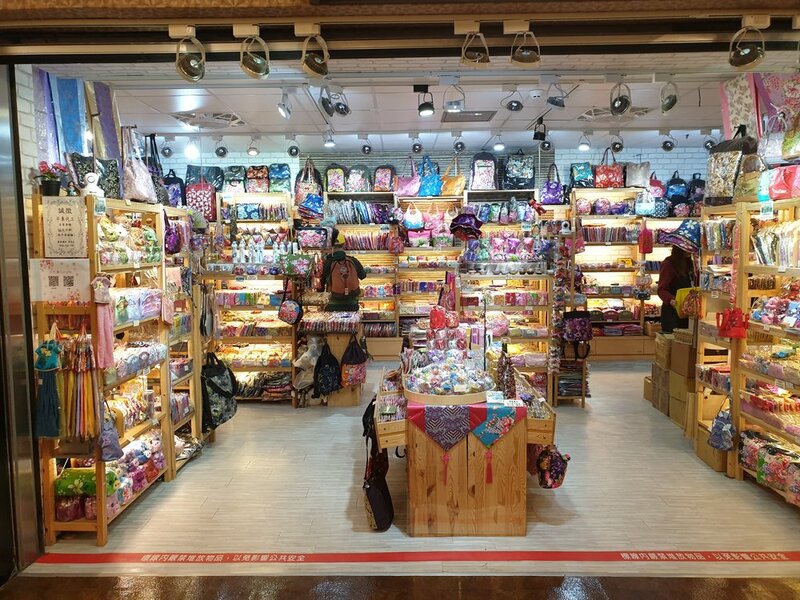 The part from Zhongshan to Shuanglian has been done up by Eslite and has outlets selling books and nicely designed stationery. This part is quite a long walk from the Main Station platforms though. In any case allow yourself plenty of time to get completely lost underground. It's improved massively since I first tried to find my way here but I still find myself confused occasionally. Within the Taipei Main Building itself is a Breeze Center department store. This mostly sells food and drink. Across Civic Boulevard the bus station has a fairly extensive shopping area called Q Square underneath it, though most things are quite pricey. I can’t really finish this post without mentioning the bizarre statue of a child with a bird head. This is a sculpture by Joyce Ho and Craig Quintero, I don’t really get what point it’s making personally, read this and maybe you will, but it is at least memorable. All locations are on the Hidden Taiwan Map.